Smartphones & Tablets – Listen, Inc.
SoundCheck is a complete system for testing and measuring Smartphones and Tablets from the R&D lab to the production line. 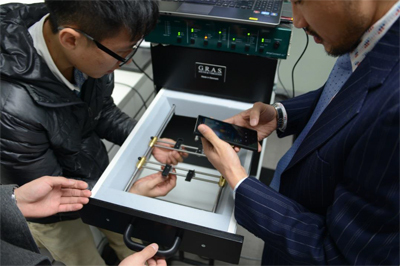 It measures all audio parameters for the speakers and microphones in the finished devices, as well as measuring sound quality to TIA standards. SoundCheck can measure all the audio in a smartphone or tablet, both in terms of measuring the speakers and microphones before they are incorporated into the product, AND for testing the complete finished product. Here we will focus on measuring the complete product; please see the pages on loudspeaker / microspeaker and microphone testing for more about how to test these components as part of an incoming QC program. Measuring the audio on a finished smartphone or tablet can be challenging as their inputs and outputs of the speakers and microphones are buried in electronics and not easily accessible. However, SoundCheck can make transducer measurements on such devices provided that you can get the audio test signal file onto your device, for example by embedding it into the device software for recall as part of the test, or simply recording it via the device’s microphone. This avoids the need for expensive cell station simulators, hugely reducing the cost of your test system. In addition, with SoundCheck’s sequence editor making production line testing easy and repeatable, and a wide variety of test signals within SoundCheck, it is possible to carry out extremely fast production line testing of cellphones and tablets. As well as standard loudspeaker and microphone tests such as frequency response, distortion, sensitivity, polarity, rub and buzz, etc., SoundCheck also measures to telephone test standards such as TIA-810 and TIA-920, enabling all the audio on your cellphone to be tested. 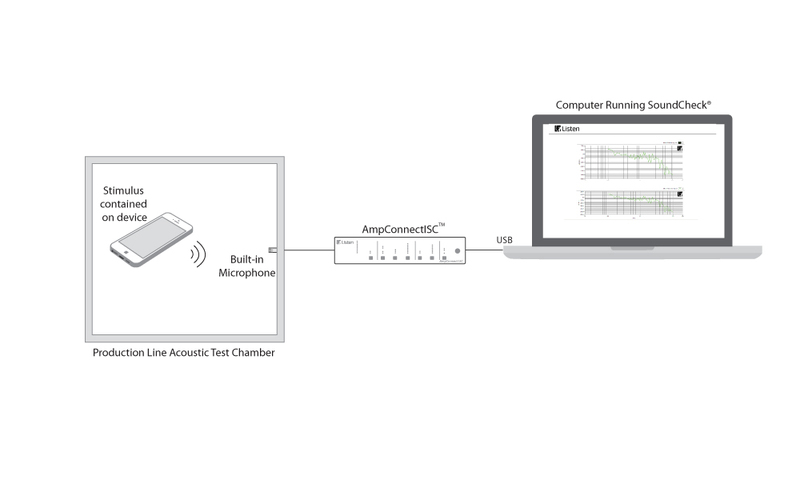 The main difference between testing smartphone/tablet audio and normal loudspeakers and microphones is that conventionally, you have an uninterrupted signal path from output to input, but in smartphone/tablet testing the inputs and outputs are not directly connected – this is known as open loop testing. To further complicate matters, the input and output may be in different domains (e.g. analog output and digital input), the input and output are asynchronous (different sample rates), and there is often a variable delay between input and output. While this sounds daunting, it is not a problem in SoundCheck. Signal path calibration overcomes the input and output being in different domains. Re-sampling and frequency shift post-processing options compensate for different sample rates and phases, and finally, the auto-delay analysis option compensates for a variable delay between input and output. In short, any test that SoundCheck can carry out on a stand-alone loudspeaker or microphone can be made on a closed loop, playback only, or record only device such as a smartphone, tablet, network audio device, digital voice recorder and more. 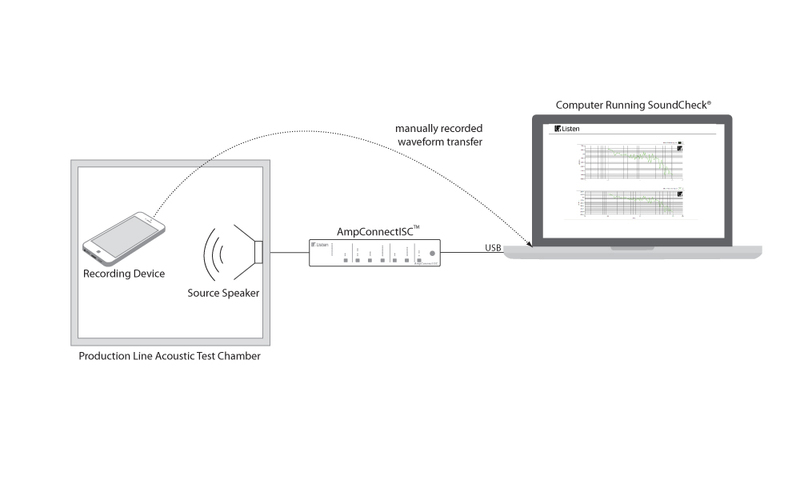 Unlimited test flexibility – although SoundCheck is pre-programmed with all common loudspeaker and microphone tests, it is so flexible that any test that you can conceive can be implemented. Simple point and click sequence development enables complex tests to be developed with no need for programming. Below are two test setups, one for playback and one for record measurement. Note that AudioConnect is a lower cost alternative to AmpConnect for a setup where there is no speaker requiring amplification. 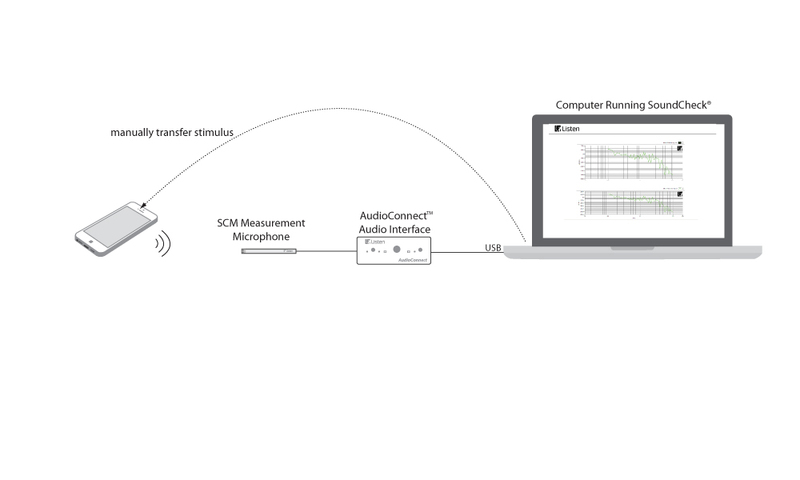 If doing both play and record measurements, then an AmpconnectISC can be substituted in the playback setup and an AudioConnect is not needed in addition. Testing smartphones and tablets on the production line using SoundCheck is fast and simple, and minimizes product returns due to audio quality issues. SoundCheck is ideal for production line measurements of smartphones and tablets as it is fast, easy to operate and can test both the speakers and the microphones. Sophisticated algorithms automatically take in to account differences in the input and output domains, different sample rates and phases, and variable delays between input and output. Below are two test setups, one for playback (speaker test) and one for record (microphone test) measurement. Examples: How do our Customers use SoundCheck for Measuring Smartphones and Tablets? More information? See the right sidebar to view detailed information about relevant test sequences, white papers, webinars and more about smartphone and tablet testing.